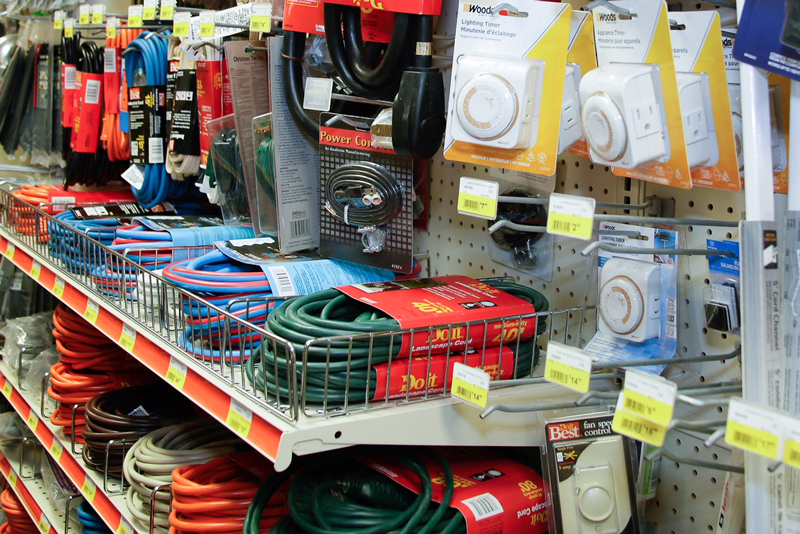 Woodstock Hardware maintains a full inventory of electrical supplies. We have everything you need to build and maintain a house/building, starting with the electrical service masthead and ending with the switch plate covers. We are continuously working to make sure our product selection and supplies are up to date with the most current technologies and building codes. Our goal is to be a one-stop shop for all your electrical supplies and needs. Whether you need two wire nuts, tamper proof receptacles, Cat6 wire, a new slide dimmer, ARCGFI breakers, a “whip” for an outside condenser, or a 250-foot roll of 12/2 NM wire, you’ll find it here at Woodstock Hardware. Installing the rough-in wiring for recessed light fixtures can give you a huge neckache if you try to nail the rough-in fixture and stand on a ladder to attach the wires. Here is an alternative: Wire the fixture on the ground; once it is complete, lift the fixture up and nail it in place. All you have to do is figure out the length of the wire feeding the light. Wire the light then drop the wire to the switch or next fixture. Where’s the best place to install smoke detectors? According to the National Electrical Code: There must be a 120-volt battery back up smoke detector on the ceiling, or on the wall close to the ceiling in the area outside of every bedroom, and inside of each bedroom. All smoke detectors must be tied together so that if one goes off they all do. Smoke detectors must be protected by an arc fault breaker. When you are roughing in for smoke detectors daisy-chain them with 14-3 WG and the extra (red) wire will interconnect the system. As you can imagine there can be hundreds of parts needed to complete an electrical project. We are confident you will find the materials, supplies, and technical expertise at Woodstock Hardware to successfully complete your electrical project.